Pamplin Media Group - How is Washington County impacted by the shutdown? How is Washington County impacted by the shutdown? From local wineries to the Hillsboro Airport, the government shutdown is having an impact. The partial government shutdown continues to make headlines across the country, as President Donald Trump and congressional Democrats wrestle over funding for a proposed border wall on the southern border. But far from Washington, D.C., people across Washington County are feeling the impacts of that shutdown. Faced with an impasse over funding for Trump's controversial border wall, many federal employees haven't been working since Dec. 22, in what has become the longest government shutdown in U.S. history. The shutdown has frozen operations for the federal departments of Agriculture, Commerce, Justice, Homeland Security, Interior, State, Transportation, treasury and Housing and Urban Development. Tens of thousands of federal workers are furloughed or not receiving paychecks, causing ripple effects locally. One area impacted by the shutdown is Hillsboro Airport, the state's second busiest, where air traffic controllers and customs agents are working without pay. Primarily a port for corporate and private planes, as well as flight trainings, Hillsboro Airport has a minimal number of federal employees working on site, according to Stephen Nagy, senior manager for general aviation airports at the Portland of Portland, which oversees the Hillsboro Airport. With workers on the job, despite the shutdown, day-to-day operations at Hillsboro Airport continue without interruption, Nagy told the Tribune. Gregory Martin, a spokesman with the FAA, said employees are doing everything they can to ensure the shutdown doesn't impact the public any more than it must. "Air traffic controllers and the technicians who maintain the nation's airspace system continue to work without pay as they fill a critical mission to ensure the public's safety," Martin said in a prepared statement. Martin said the FAA is calling in inspectors and engineer as appropriate to address issues but declined to state what that has meant at Hillsboro Airport. Aviation across Oregon is impacted by the shutdown. The Federal Aviation Administration's Field Safety District Office — an important branch of the FAA responsible for overseeing aviation operations and enforcing safety standards — is based in Hillsboro off Northeast Century Boulevard. The office is in charge of enforcing federal aviation rules and safety standards. These days, calls to the office's main line go unanswered. A small handful of managers are on the job, without pay, handling a few small projects deemed critically important, according to employees. In order for students to receive their pilots license they must first pass a practical test, known as a "check ride" test, which is administered by the FAA. 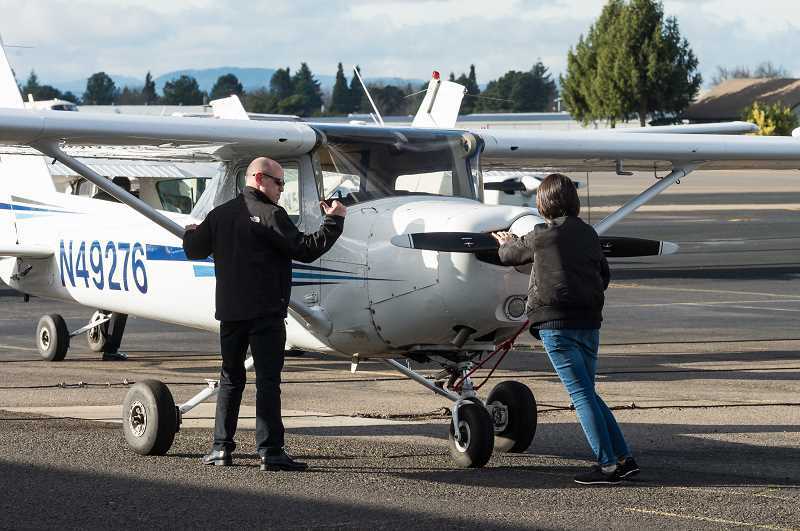 Without FAA employees on the clock, Hillsboro Aero students are unable become licensed pilots. Outside of aviation, Oregon's alcohol industry is also impacted, without federal employees on hand to approve any new beer, wine or spirit labels. Until the government re-opens, no new products can enter the market. The Alcohol and Tobacco Tax and Trade Bureau is tasked with overseeing new breweries and wineries, and must approve any new beer or wine before it can hit store shelves. That office is currently closed. Labels on beer and wine must be approved by the federal government. Government warnings about alcohol must appear in certain places on the label. There are rules about font sizes and terminology. Oregon wines labeled as Burgundy or Bordeaux aren't allowed. "If there's no labels to put on the bottles, you have decide to either hold the wine or bottle the wine without them," said Kevin Green, winemaker at Apolloni Vineyards, west of Banks. "That means you spend more money to store your products. For some wineries, if they have sold out of a product, like a rosé, they want to get a new product out as soon as possible. It's a time-sensitive product, wine is seasonal. 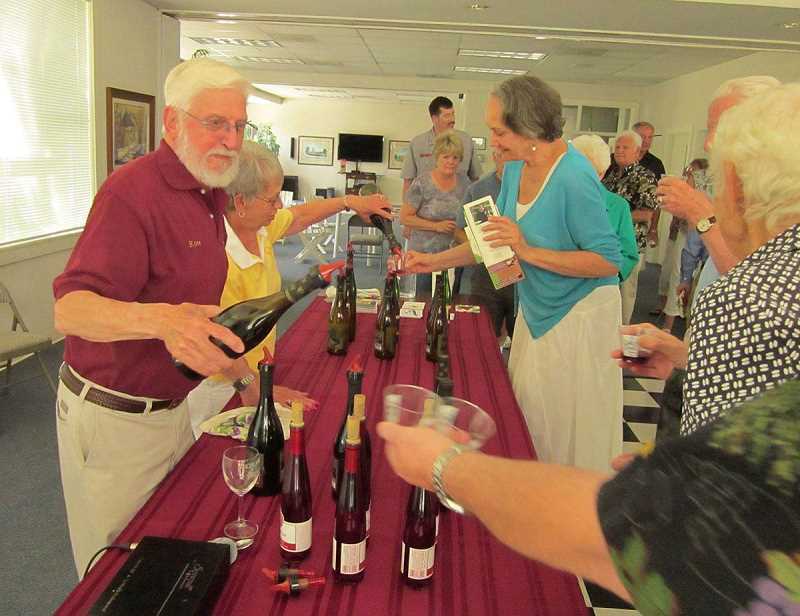 Depending on the winery, not having that label ready could affect sales immediately." Greg Lint, winemaker at Oak Knoll Winery south of Hillsboro, is currently working on a new wine he planned to reveal to members of his winery's wine club this spring. He planned to send the labels in for government approval this month. With the government shut down, Lint said he'll have to make other arrangements. "It's all up in the air right now," he said. "What's going to happen as long as the government is closed, and how long it will take to get back up and running again once it reopens, is a mystery to all of us right now." Lint's new label was for members of his wine club, and isn't expected to be sold to the general public, thankfully. "If this was for distribution, that would put us in great jeopardy," Lint said. When the government eventually reopens, Lint and Green are expecting the Bureau to be backlogged with labels in need of approval. "It has significant impacts on the industry," Green said. "Our next bottling is in February and in April. If the government reopens tomorrow, there will be a buildup. If you need approval, you may still be affected in April." Aubrey Wieber contributed to this report.